The smallest unit of memory is the “bit”. A bit can be in one of two states— on vs. off, or alternately, 1 vs. 0. Technically any object that can have two distinct states can remember one bit of information. This has been done with magnets, gear wheels, and tinker toys, but almost all computers use little transistor circuits called “flip-flops” to store bits. The flip-flop circuit has the property that it can be set to be in one of two states, and will stay in that state and can be read until it is reset. Most computers don’t work with bits individually, but instead group eight bits together to form a “byte”. Each byte maintains one eight-bit pattern. A group of N bits can be arranged in 2N different patterns. So a byte can hold 28 = 256 different patterns. The memory system as a whole is organized as a large array of bytes. Every byte has its own “address” which is like its index in the array. Strictly speaking, a program can interpret a bit pattern any way it chooses. By far the most common interpretation is to consider the bit pattern to represent a number written in base 2. In this case, the 256 patterns a byte can hold map to the numbers 0..255. Used in place of PROM during development phase; UV Erasable and Electrically programmable by a device programmer. Used during the program run to save non-volatile data and results (for examples, date and time of a transaction, present port status, port driving history, system malfunctions history); Electrically Erasable by writing a byte or a set of bytes with all 1s and Electrically programmable during a program run one byte write at each write instance. 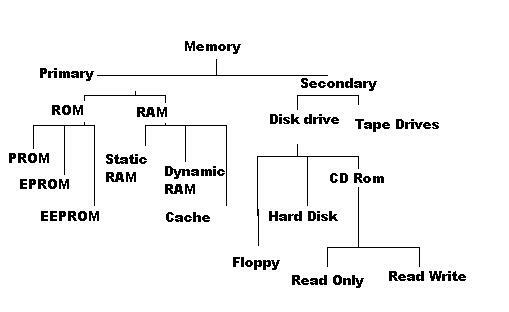 The RAM can be both read and, written, and is used to hold the programs, operating system, and data required by a computer system. In embedded systems, it holds the stack and temporary variables of the programs, operating system, and data. RAM is generally volatile,does not retain the data stored in it when the system ‘s power is turned off. Any data that needs to be stored while the system is off must be written to a permanent storage device, such as a flash memory or hard disk. SRAM chip uses flip-flop technology. As computer processes data it changes its states from 1 or 0 and thus refreshing is not required so SRAM are very fast. SRAM is the nearest of memory or cache in proceesor. Also very expensive, as it requires much larger density. As four to six transistors are required to store a bit using SRAM. It is the computers main storage media that stores data permanently. Data on hard disc is interpreted using disk controller. Read only – Write once only. CD stands for Compact Disc. The CD is an optical disc format developed by Sony and Philips starting in 1979. It was originally developed as a format to store audio and still is the biggest selling medium for recorded music from major and independent record companies. An audio CD can hold up to 80 minutes of audio data, stored using 16-bit PCM at a sampling rate of 44100 Hz. A standard CD is approximately 120mm in diameter, but 80mm discs also exist that can store about 20 minutes of audio. Data can be written multiple times by erasing and writing again. This entry was posted in OS. Bookmark the permalink.